If you’ve been around in the vape community for a while, chances are you know about Smok’s products. What’s nice about this brand is the array of aesthetic options available, as well as the overall quality. It’s a great brand to start vaping with, because their products are easy-to-use, plus it’s fairly simple to grow with them, so to speak. Some advanced vapers love Smok for the convenience of their vape kits and keep one on hand as well. 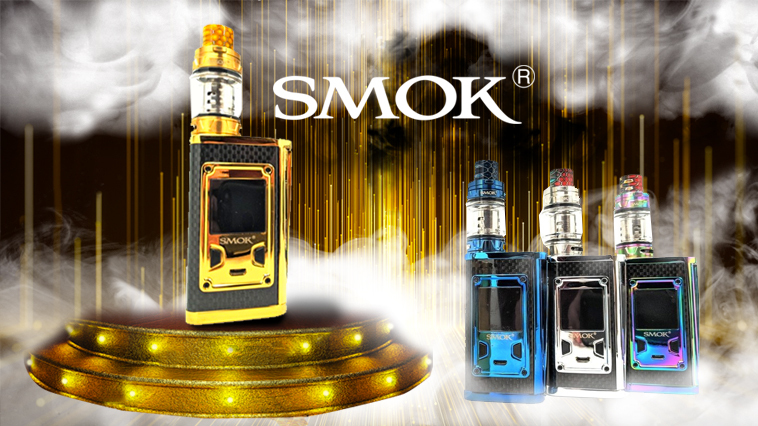 One of their notable kits is the Smok Majesty Luxe 225W TC Starter Kit. The Smok Majesty Luxe 225 TC Starter Kit is an upgrade from the original release of the Smok Majesty 225W TC. The upgrades in this kit include the TFV12 Prince Tank and of course, the beautiful aesthetics of the mod itself. The upgraded user interface is essentially the same you will find in a Smok ProColor or the S-Priv, which means you can expect easy navigation and a nice firing response. The feature that really sells this mod as compared to other Smok products is the design. Outwardly striking, the Majesty is available in two different design styles: a carbon fiber base and a cobra resin base. There are four different finishes for each of the designs: gold, blue, chrome, and rainbow. If you really want an expensive-looking mod, the gold and chrome finishes pretty much top the other finishes. The materials of the mod are zinc alloy and carbon fiber. It’s also worth noting that the Smok Majesty Luxe 225W Starter Kit feels well-crafted and sturdy. In fact, I would go as far as to say that this mod’s design feels better constructed than the ever popular Smok ProColor. You get the Smok Majesty Luxe Edition 225W TC Mod, the Smok TFV12 Prince Tank, one 0.4 ohm Q4 Quadruple Vape Coil (Pre-Installed), one 0.12 ohm T10 Decuple Vape Coil, a replacement glass, a USB cable, a user manual, and spare parts. The Smok Majesty Luxe box mod has a highly functional U.I. (user interface), a 225W max output, and Smok’s TC control suite, which works with Nickel, Titanium, and Stainless Steel builds. On the front of the mod is a 1-inch color OLED screen and if you look to the side of the mod you will find the large firing button. Something nice about this mod is the more ergonomic fit. It doesn’t feel uncomfortable to hold or at all awkward. As always with a Smok product, you can rest easy knowing that there are several safety features such as Short Circuit Protection, Overheating Protection, and an Over Charging Protection. The Smok TVF12 Prince is arguably one of the nicest sub-ohm tanks on the market. It’s got a press-to-open top fill system, is constructed out of stainless steel, and comes with a 5ml glass, as a well as the 8ml bubble glass. The resin drip tip is a nice little addition to the overall look of the tank and it stays on without coming loose. The TVF12 Prince uses the Smok V12 Prince coil system. Your options for coils are pretty wide, as the V12 offers seven different coils to choose from, including some of the new kanthal mesh tech coils (which are great if you like intense flavor and moderate clouds). The two coils included in the kit are the 0.4 ohm Q4 Quadruple (for use at 40-100W) and the 0.12 ohm T10 Decuple (for use at 60-120W). If you’re looking for huge clouds, the T10 is going to be a pleaser. Smok’s coils usually last about a week if you take care of them properly. If you’re already a fan of Smok products, you’ll love the Smok Majesty Luxe 225W TC Starter Kit. It compares well to the power of a Smok ProColor. In fact, there aren’t too many differences—except for the fact that the Luxe comes with the TFV12 Prince tank. The TFV12 Prince is a large step up from the TFV8 Big Baby tank. Overall, the power behind the Majesty Luxe is quite impressive. If you’re in the market for a starter kit, whether you’re a beginner or an experienced vaper, the Smok Majesty Luxe 225W TC Starter Kit is a purchase you should consider. There aren’t too many downsides to this kit, the tank is fantastic, and it’s an eye-catching design—plus it’s got a nice U.I. and a ton of coil options. Ready to take the leap? Purchase the Smok Majesty Luxe 225W TC Starter Kit from MistHub. Do you want to check into Smok’s other options? Check out our review of the Smok TFV12 Prince Cobra Edition Tank or the Smok G-Priv 2. For other reviews, take a look at our hardware review section.